Our thanks and appreciation in Zirika! 's website (in a place therefore provided) to those that have contributed to our project, showing their names. Appreciation in our website, and a small gift (card specially designed by ourselves) and a bag designed expressly for the crowdfunding campaign. Appreciation in our website, and a small gift (postcard) a bag and a t-shirt designed expressly for the crowdfunding campaign. THIS REWARD IS EXPRESSLY DIRECTED TO ORGANIZATIONS. Appreciation and a small gift (postcard) . In addition we offer collaboration in the organization of an event in ZIRIKA (conference, projection presentation of a book) choosed by the organization. THIS REWARD IS EXPRESSLY DIRECTED TO ORGANIZATIONS. In return we offer appreciation in our website, a small gift (postcard), and collaboration in organizing an event in ZIRIKA! plus recording and spreading it (conference, projection, presentation of a book) that the organization chooses. A step forward to improve Zirika! Buy semi-professional motorized and foldable screen, semi-professional projector of 5000 lumens and speakers and amplifier. We will also buy a portable baffle for activities on the street, which will be available to social movements. In addition to being able to nurture the website of Zirika, which will be launched after this campaign, we will buy a video camera, a tripod and a voice recorder. We believe that children also deserve to have a space in Zirika!. We will condition a part of the main room in which they will have playful and educational material. This space will be adapted depending on the needs. Considering that Zirika! is a combative space, we beleive that it should be the loudspeaker of the activities of the groups that are using the space. We will arrange visible and ordered spaces for posters and leaflets through acquiring metal plates and magnets, and displays for leaflets, stickers and so on. Make Zirika a pleasant meeting space where everyone can check the books of our popular library, study, read a book having coffee, tea or beer ... Acquisition of furniture (shelves and tables), painting for the 132m2 wall and wood for the decoration of the first stay, a display refrigerator and a coffee machine. Change lighting. So far, the second room has been used by different groups to hold their meetings, but we believe that for this purpose the space also needs to be pleasant. This will be achieved by painting and acquiring new tables and chairs. Historically, the sale of material has been, and continues to be, one of the main sources of funding for many organizations. This is why we want Zirika! to become a point of reference where everyone colud acquire this type of materials. We need furniture exhibitors and shelves to achieve this. The arrangement and change of the floor of Zirika! will make it a more pleasant space and we believe that it would greatly improve the conditions to carry out any activity in it. The new floor will be made of an epoxy resin, a durable and durable material. Provide the space of a heating system that will make it more pleasant to stay and participate in it. 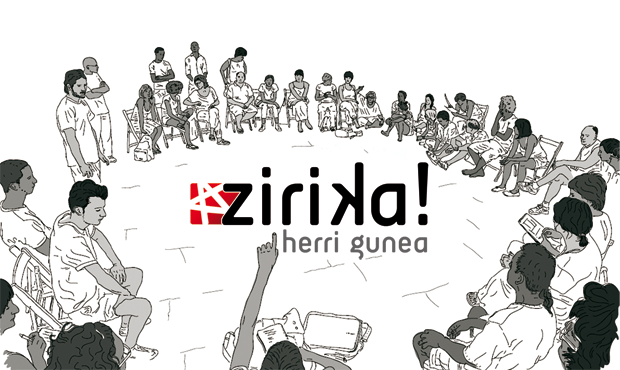 “Zirika herri gunea” is a space aimed at social transformation and political imagination. A multi-purpose and self-managed space. 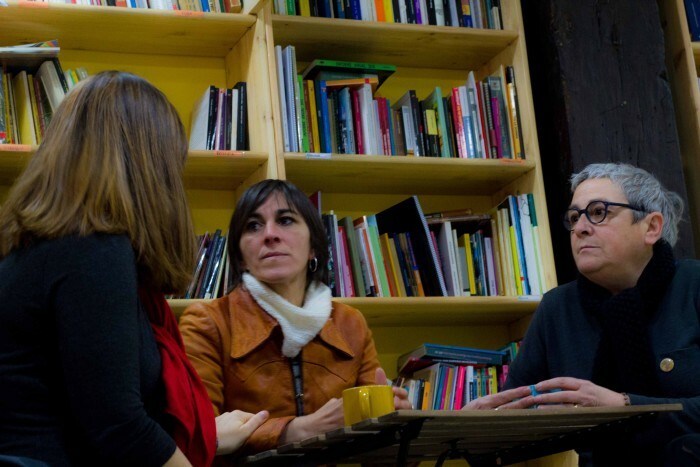 Help us take a step forward to build up a city of Bilbao for all. With the same excitement we had when we started and fuelled by the social response that “Zirika herri gunea” is having, today we are living this project’s consolidation. And this implies several improvements of the space and new challeges, which will only be possible with your support, both economic and human. Place your brick so that Bilbo has less gloomy spaces! 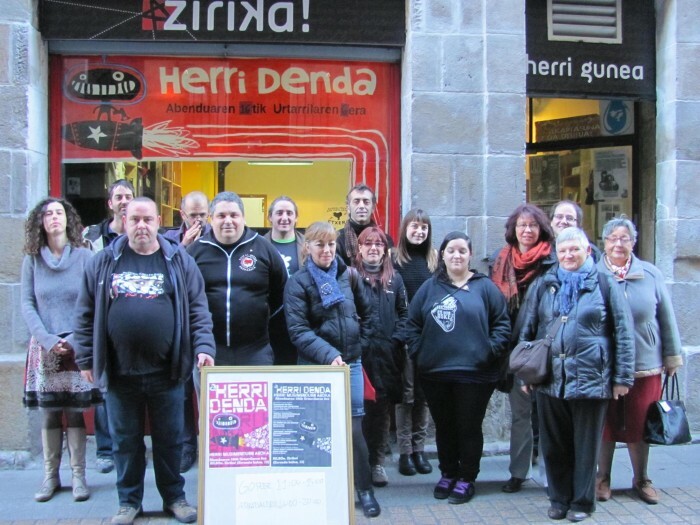 ”Zirika Herri gunea” is a 100 m2 space in the historical centre of Bilbao. 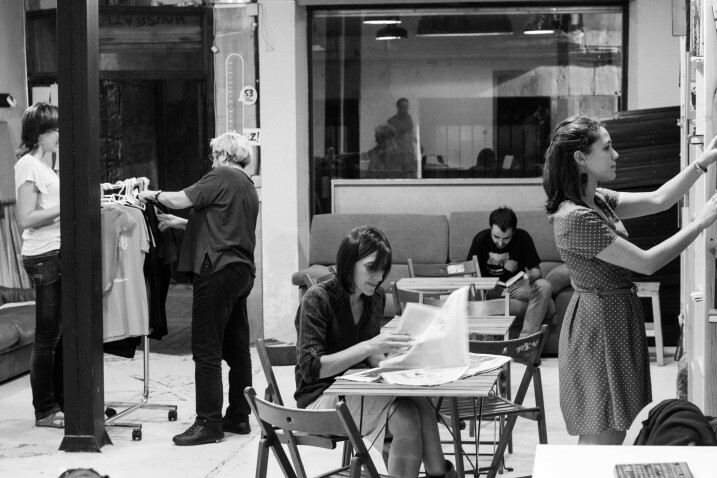 It’s an open and self-managed space, directed towards social movements and individuals. All the activities organised in Zirika! are open and free. In the last years it has become an essential space for social movements to gather and imagine politically. This place helps creating dialogue, enriching debates and shaping strategies and tools for transformation. 1) The first area is wide. Here we can find the people’s library, the video library, the bookstore, the shop window with several materials and a space to hold meetings. This space is the most used for a lot of activities (lectures, meetings, discussions over films, presentations of books, parties, etc). 2) The second area is smaller and multi-purpose (meetings and storage of different materials). 3) And the third area is the stock. It has two heights and this is where we keep different groups’ materials and our own equipment for the txozna (a stand with a bar) that the members of the internationalist group Mekauen build in Bilbao’s fiestas, Aste Nagusia. This bar is one of the most important sources of income for us. ”Zirika!” is meant to be for all social movements and individuals who, using their ability for critical thinking, reflection and action, are helping, in different ways, to transform society. You are invited to all activities, all open and for free. The goal of this campaign is to take a leap forward to make “Zirika!” a better prepared and friendlier space for the many activities organised in it. When we first started “Zirika”, four years ago, we cleaned up the space and started the project with great hopes but few economic resources. Our excitement and work capacity led us here, and we think that it is necessary to carry on and keep improving. We want “Zirika!” to be a more open, more useful and a better place. Indeed, to keep generating in better conditions. In order to achieve this, we want to take a leap forward and make quite a few improvements. For example, we would like to rethink the use of space. 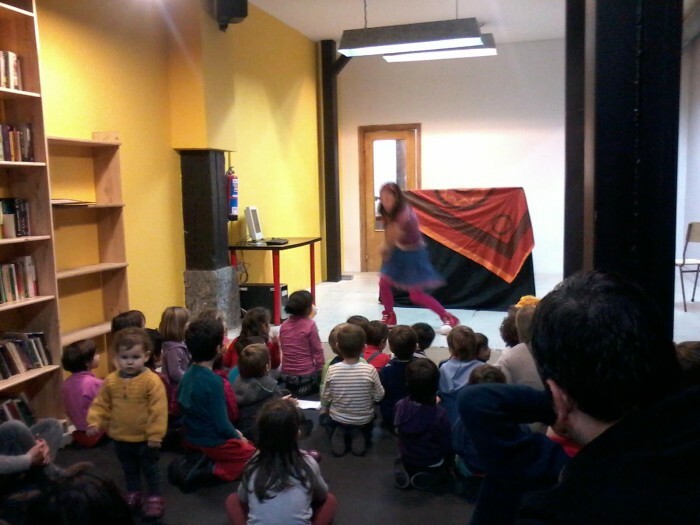 We want to set up a first room more suitable for projections and other activities. Therefore we need to buy a screen, a projector and get a better sound system. We would like to improve the people’s library too. Also, we want the second room to be more comfortable and organised, as well as painting it. We want it to be more multi-purpose, arrange the toilet and provide a space for the youngest. Besides, we would like to expand the space devoted to the diffusion of social movements’ materials, such as books and other products. 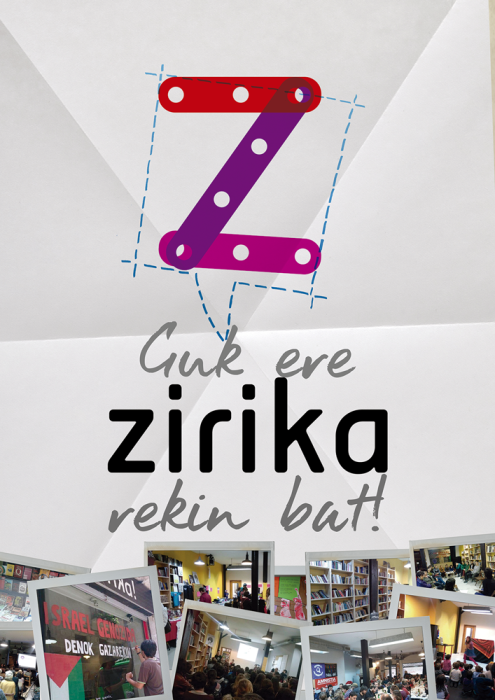 Moreover, we want to have a website that informs periodically about the activities organised in “Zirika!”. Finally, we would also like to provide social movements with a sound system and better equipments. With all of this, we want you to feel like spending some time in “Zirika!”, to carry on building together other models of society, other ways of doing things. 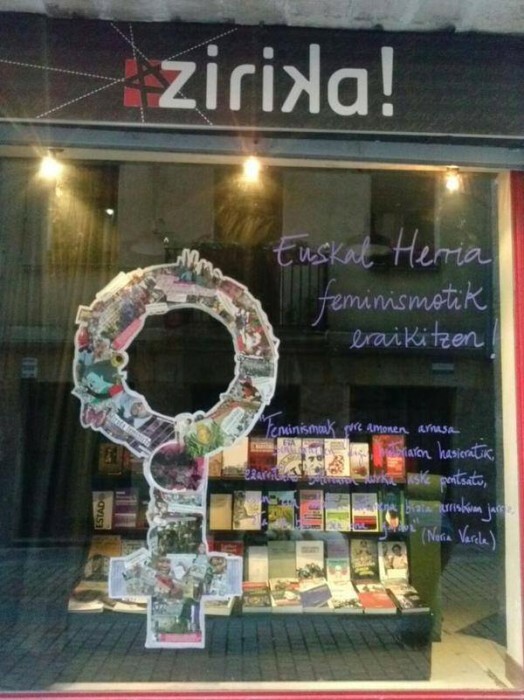 It’s been more than four years since the internationalist organisation “Komite Internazionalistak” (KI) took up the space left by the critical and reference bookshop “Gatazka”. 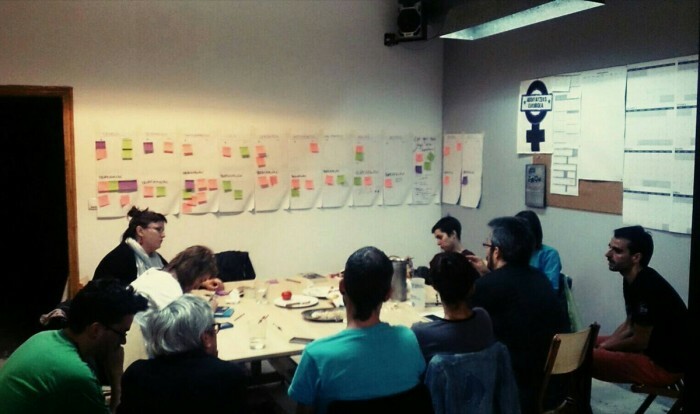 We aimed at managing the place with an open desire to make of it a workshop of ideas and a loudspeaker for the social movements of our city, Bilbao. That is the way “Zirika! herri gunea” was born. 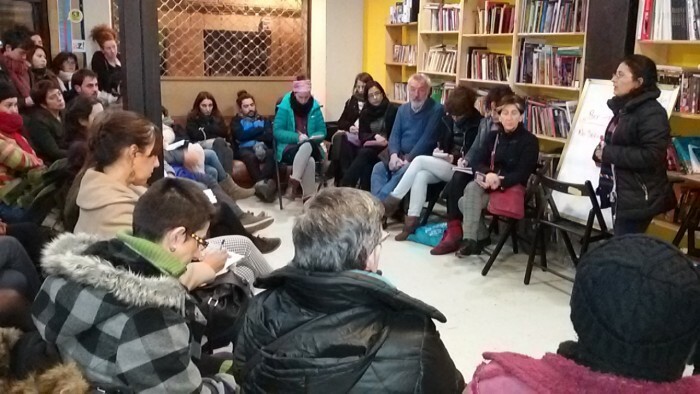 KI is an autonomous organisation that practises political solidarity, founded in 1979 to build up networks with other peoples and their struggles. It’s an organisation committed to the global fight against the current neo-liberal system, with an anti-capitalist, feminist and anti-imperialist perspective. Offer a people's library with a wide collection of paper and audio-video materials to be checked in place or borrowed for free. Offer a place where children can enjoy themselves, also with their parents. 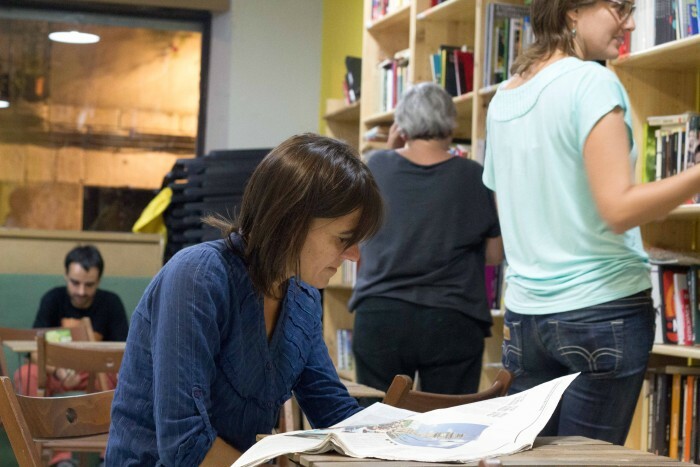 Offer a permanent place where groups' material will be esay to access and buy. Zirika! will offer an adequate place for organisations and groups to hold their meetings. 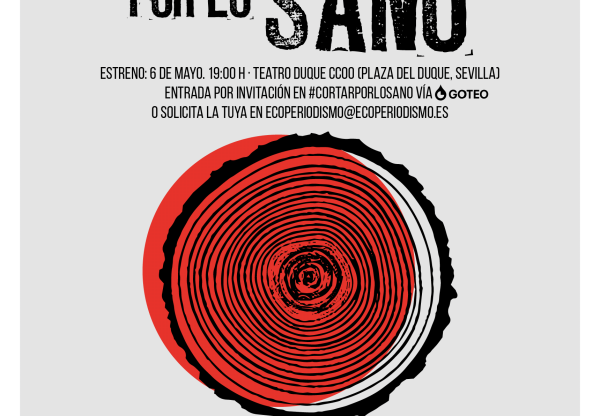 ¡Bring your tools and abilitities to build a better Zirika! Help us prepare the restoration (moving things, cleaning, etc.). Help us register and catalog the collection of books and documentaries of Zirika's people's library!